The door that would not open no matter how hard you pushed, no matter how long you pounded on it. The screams no one heard. Darkness, hunger, pain. Slow suffocation. One day it occurred to me that I needed to experience the same suffering he (my son) had. First, I turned off our refrigerator and emptied it: last night’s potato salad, ham, eggs, cabbage, cucumbers, wilted spinach, yogurt, some cans of beer, pork–I pulled everything out and threw it aside. The ketchup spilled, eggs broke, ice cream melted. But the refrigerator was empty now, so I took a deep breath, curled myself into a ball, and slowly worked my way inside. As the door closed, all light vanished. I could no longer tell whether my eyes were open or shut, and I realized that it made no difference in here. The walls of the refrigerator were still cool. Where does death come from? This collection of short stories is quite different from Ogawa’s book The Housekeeper and The Professor, which I loved for its gentle portrayal of an unconventional family. Yet I suppose the bridge was built from that novel to this collection with her novel Hotel Iris. I wonder if this is where Ogawa’s writing will continue to take us, deep within the dark and horrifying. The stuff that in small quantities effectively chills our spine, but in greater doses induces despair. I found it quite dark too. It's not a book to uplift the spirits – I balanced it with reading a romance at the same time. Dark seems the choice of many Japanese writers – I wonder why? Do happy novels not get translated as often or am I just drawn to the twisted ones? I very much prefer Ogawa's dark approach. Sorrow, death, grief, and pain has always had something of a gravitational pull for me, almost willing me to understand how they are inexplicably intertwined. I loved The Housekeeper and the Professor so I do plan to read this one. Happy Easter; hope your day is special. I'm sorry to hear you couldn't continue with this. I read Hotel Iris and Diving Pool so I knew what Ogawa is capable of. I'll read this when it eventually get published or easily available in the UK. Tame, yes, but also so original. I love how families can be depicted in our lives in so many other ways than the traditional. Happy Easter, dear Sylvie! I will look for you on Goodreads, which I only frequent sporadically. I can see that you and Tony know much more about Ogawa's style than I. One of the great philosophical questions of my childhood was: when you close the refrigerator door, does the light stay on, or go off. Ogawa's answer clearly is that it goes off. Since I prefer living in the light, I believe (1) I'll stay out of refrigerators and (2)choose to huddle in places where the light never goes out. I'm no Pollyana, but I've lived through quite enugh darkness. I have no need to immerse myself in it by choice. Proust is coming…slowly. I've been list Ing to it going to and from work, and with Spring Break this week, I haven't heard it at all. I do like it, though, although one certainly doesn't read Swann's Way for the plot! I like how you said those darker elements of our being have a pull toward understanding them. Surely that is a big reason for why we read: to gain a deeper understanding of our psyche. And, of course, as you said how they are intertwined. The Diving Pool is the only one of hers I haven't yet read. But clearly, Revenge and Hotel Iris explore the darker nature of people (and the world), while The Housekeepet and the Prodessor stands alone. That was the first Ofawa novel I read, and I loved it. I prefer places where the light never goes out, too. 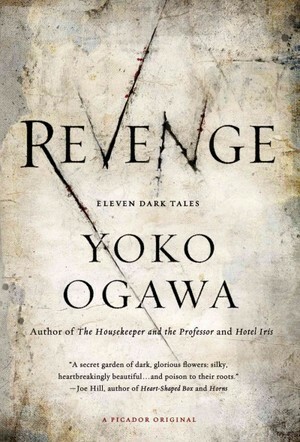 As for philosophical questions, lately I've been wondering why novels and television shows are entitled 'Revenge'. Possibly because there's little interest in a show called 'Forgiveness'? I've read both The housekeeper & the Professor & The Diving Pool, and although I enjoyed the first, the second had me hooked, so this has been on my wishlist since I learnt of its existence. Happy Easter to you and your family! I'm sorry that you couldn't continue with this one – I really thought you would like it. I agree that it is rather dark, but that is what I liked about – the way that Ogawa explores the dark and twisty nature of life. I just found the stories fascinating and very thought-provoking. But I can understand how it might be too much darkness to take in. Hope you enjoy your next read! Hmm, doesn't sound like something I could handle reading. I have enough trouble dealing with my own grief . . . still . . . always. I just finished this book too but was somehow expecting something even darker (!) I've only read The Housekeeper and the Professor which I loved and didn't really fancy trying her other stuff. I sometimes think that a lot of the Japanese translated fiction tends to be overly dark (there's a lot more out there than dark, twisted stories published in Japan and it isn't my image of Japanese fiction) and that maybe it's a marketing thing.